You won't believe what the prospectus had to say. Imagine this scenario for a moment -- it might help you better understand how a $1 billion-plus fund collapsed in a matter of minutes last week. Let's say that you have a die to roll. But this isn't any ordinary die -- it has 100 sides to it. A single roll costs $1,000. All but one of these sides promise you a gain of $100. In other words, if you roll the die 50 times, chances are you'll make $5,000 -- pretty amazing deal! But there's a catch: the 100th side results in an absolute loss of any money that you have gained, as well as your original investment in the game. Would you roll this die? How many times would you roll it? How and when would you know to stop? This, in a simplified version, is what happened to investors who held positions in the VelocityShares Daily Inverse VIX Short Term ETN (NASDAQ:XIV). The fund was designed to be the inverse of the S&P Volatility Index (VOLATILITYINDICES:^VIX) -- a measure of market volatility. In other words, as long as the markets were not volatile -- and they were famously smooth over the past year-plus -- you would make money. Before 2016, this wasn't the case, but things have been so smooth that the returns through the end of January were fantastic. And then, almost overnight, they weren't so great. It was like rolling that die and getting the 1 in 100 chance of a total wipeout. The XIV -- issued by Credit Suisse (NYSE:CS) -- collapsed with the enormous spike in volatility that accompanied the market's downturn in the first week of February. That left anyone holding a position in the fund with almost nothing to show: prices have dropped 96% from 52-week highs and the entire fund will soon be liquidated. It's impossible to know exactly who was holding a position when the collapse occurred -- the fund only publishes its holders at the end of each quarter. According to Bloomberg, however, 32% of it was held by Credit Suisse itself at the end of the third quarter. The bank has denied it has any losses associated with the XIV's dive, principally by hedging against the risk of this happening by holding VIX shares as well. The same, however, cannot be said for the other two-thirds of the fund's holders. Regardless of who lost money, there's still an enormously valuable lesson for investors here. Recently, I wrote a preview of former trader and best-selling author Nassim Taleb's new book, Skin in the Game. We should never take the type of risks that can lead to ruin. Instead, we should keep our mistakes small enough to avoid ruin, but big enough to learn from...[as Taleb says], "Small injuries will be beneficial, never larger ones. Fearmonging about some class of events is fearmonging; about others it is not. Risk and ruin are different tings [sic]." By ruin, Taleb is referring to your entire portfolio. Losing all of your money on a small bet is no big deal -- you can learn from it. But making a huge bet that can wipe you out entirely is another thing altogether. The reason for this is actually simpler than you might think. Let's go back to the die example. While it's exciting to know that you'll get money from 99 out of 100 rolls, that single roll is what's called an "absorbing barrier". Once you hit it, you are dead, financially speaking; there's no coming back. And the longer you roll the die, the more likely you are to lose everything. Here's what the probabilities look like with the 100-sided die over time. By the time you roll the die 75 times, you're likely to have already lost everything. The takeaway for investors is clear: even though the rewards can be enticing (greed), never invest in anything that has the potential -- nay, an incredibly high probability over the long run -- for immediate and total ruin. No matter how small the risk of immediate ruin is, continued exposure to it (stupidity) will result in you going broke. Fellow Fool Jordan Wathen already highlighted a number of different vehicles individual investors should avoid to make sure they steer clear of such outcomes. Rule Breaker investing is based on spreading many small bets on a large number of "risky" stocks. Many of them will fail, but if even one turns out to be a huge success -- a "positive black swan," if you will -- it can cancel out all of the losses from the other investments. 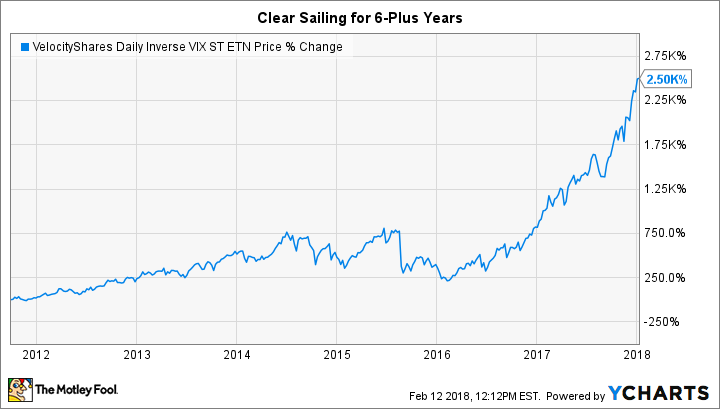 If you invest solely in a suite of products similar to the XIV -- even if you spread them around evenly -- you'll be almost assured of losing all of your invested capital over a long-enough time frame. The unlikely "negative black swan" will eventually hit each of these investments. All it takes is one day like the one that occurred in early February to wipe out all of your gains. If that seems a little confusing, perhaps it's best to simply remember this: a basic rule of thumb from investing great Peter Lynch should really do the trick -- if you can't explain what you're investing in to a child, using only a crayon and a sheet of paper, you probably shouldn't be putting money into it.